Objective: Research cultural trends in dating and television and use that research to apply to The Bachelor. I’m a huge Bachelor fan. I’m commissioner of the Brandcenter Bachelor league, I host viewing parties at my apartment, and I follow a bunch of the former Bachelors and Bachelorettes on Instagram. Rather than letting my fandom go to waste, I decided to put my knowledge of dating, culture, and The Bachelor to the test and submit an application to be on the 2018 season of The Bachelor. The Opportunity: Create a character worth watching. Not every contestant will fall in love with the bachelor, but every contestant should be someone America will love (or love to hate). Each person fills a role. In the world of reality television, people get placed into boxes. Viewers want to feel like they understand a person instantaneously, and so it’s important to give them a quick way to relate to each person. The show follows the same story arc season to season. While the people and the locations change, the storyline stays the same from season to season, with love, conflict, and eventually a happy ending. Because the story stays the same, it's up to the contestants to make the show worth watching. The casting producers are playing double duty as matchmakers. At the end of the day, The Bachelor is a dating show. The Producers want good TV, but they also need people who will be the right fit for that season's Bachelor or Bachelorette. And if they pick someone who ends up working out (marriage, kids, etc. ), it helps legitimize the story/franchise. The Insight: In dating and in casting, your flaws matter just as much as your strengths. When you love someone, you love the whole person. Those little quirks that make you fall in love with a significant other - an adorably crooked smile or a laugh that makes everyone in the room take a second look - are also what make us fall in love with a character on television or in a book. The STRATEGY: Flaws ARE MORE fascinating. Time to play up that self-deprecating humor. I initially applied online in January of 2017. After 4 months of not hearing back, I had given up. Then I got a call from a random LA number. I figured it was spam and didn't answer. They left a voicemail, which I also assumed was spam and didn't listen to. 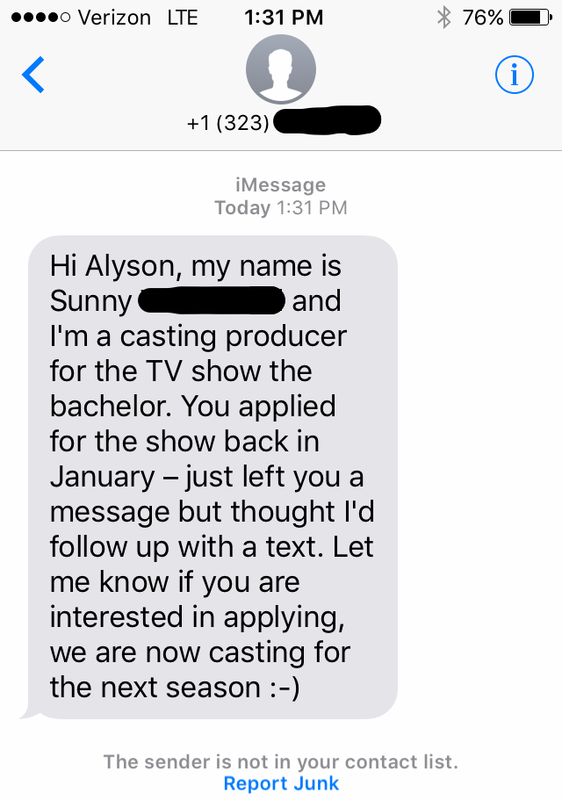 Then I got a text from the casting producer. Part of the application process involves creating a video to help the casting producers get to know each contestant better. They sent a list of questions to answer, which I ignored. 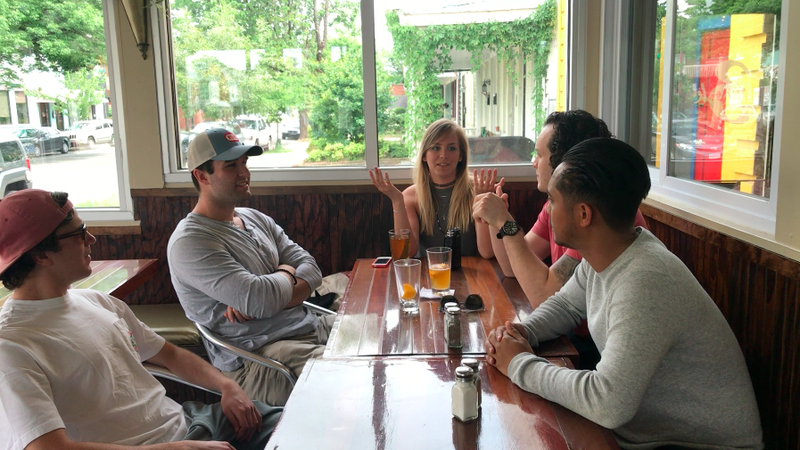 Instead, I set up my own real life Bachelor group date by inviting all of my exes (well, actually it was a bunch of guys from Brandcenter who pretended to be my exes) to a round of beers where they could spill the beans on the demise of our respective relationships. This was intermixed with clips from friends telling the camera what they thought of me (because friends have a habit of being the most brutally honest) and shots of me making horrified reaction faces. ABC technically owns the video, so here's a screenshot from my group date. The awkwardness on my face says it all. I told the producers that for my entrance, I wanted my own limo filled with corgis so that I could come in looking like the Queen of England (and as a bonus, I would get to play with the corgis all night). In addition to the video was a pretty detailed questionnaire - kind of like your standard job application but on steroids. The questions included things like "What's your favorite drink?" (I guess this is how they figure out what to stock the bachelor mansion bar with), "Have you ever had a restraining order issued against you?" (probably a good thing to ask but no), and "Are you genuinely looking to get married and why?" (got to be there for the right reasons). I made it to the second round...then I got cut. After a couple more email and text exchanges with the casting producer and some additional questions, I got the dreaded final sentence in an email from casting. "You will only be contacted if producers move forward." I can only assume it's because the producers didn't want to spring for the 10 corgis I requested for my entrance.